The Annual Plan offers an annualized summary projection. This type of plan is best used for a quick analysis of farm profitability when the operation is simple and straightforward. The Monthly Plan provides monthly detail in the projection. This plan type is best used in status quo plans where customer tax history is used. Peak operating needs for the year can be estimated in a monthly plan. The Monthly Plan with Budgets is best used when considering enterprise details in the projection. Here a lender may be working with a customer to evaluate scenarios or significant changes to the operation, like a farm transition, adding an enterprise, or changing the crop acre mix. 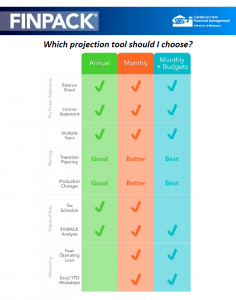 Use this chart to determine when to use each projection tool.